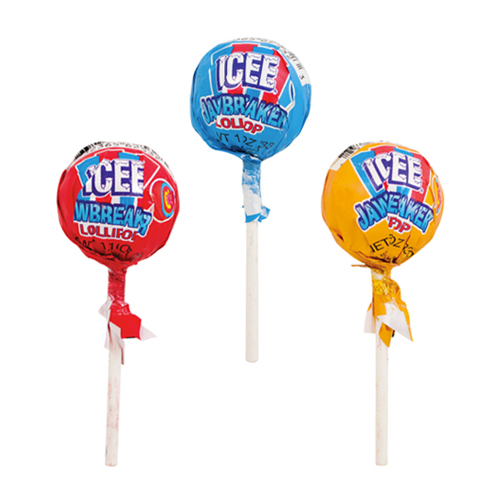 ICEE® Jawbreaker lollipops have a tasty liquid gumball center! The display box is an assortment of your favorite ICEE® flavors: Cherry, Blue Raspberry, and Orange. 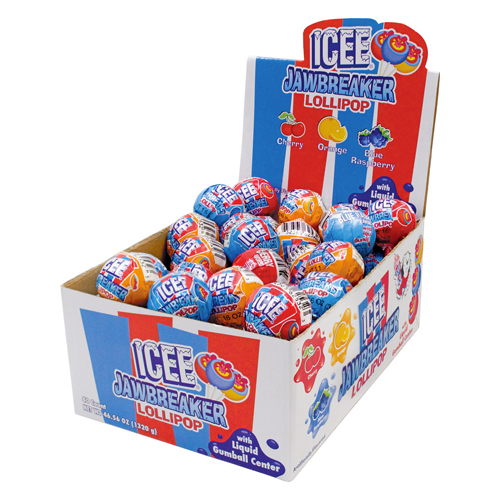 Each ICEE® Jawbreaker Lollipops display box contains 40 pieces. INGREDIENTS: DEXTROSE, SUGAR, GUM BASE, GLUCOSE SYRUP, MALIC ACID, GLYCERIN, ARTIFICIAL FLAVOURINGS, MODIFIED STARCH, CITRIC ACID, ARTIFICIAL COLOURS( FD&C YELLOW 5 LAKE, FD&C YELLOW 5, FD&C RED 40 LAKE, FD&C RED 40, FD&C BLUE 1), TURMERIC, BHT (TO MAINTAIN FRESHNESS).